A few weeks ago I attended a well-organized webinar on the "livestream" platform hosted by Michael Leclerc over at Mocavo.com, but the marketing person wouldn't let me say a thing about it as the website was in the process of internalizing the hosting. Now things have been squared away, I am happy to note the archived version of a chat with Maureen Taylor, the Photo Detective is on tap for those Mocavo Plus members who venture over. 2. Log in to your Plus account. 2. Click "Community" on the top nav bar. 4. Select "Fireside Chats" from the drop down menu. Notice that below the video is the "Have a Question?" field. 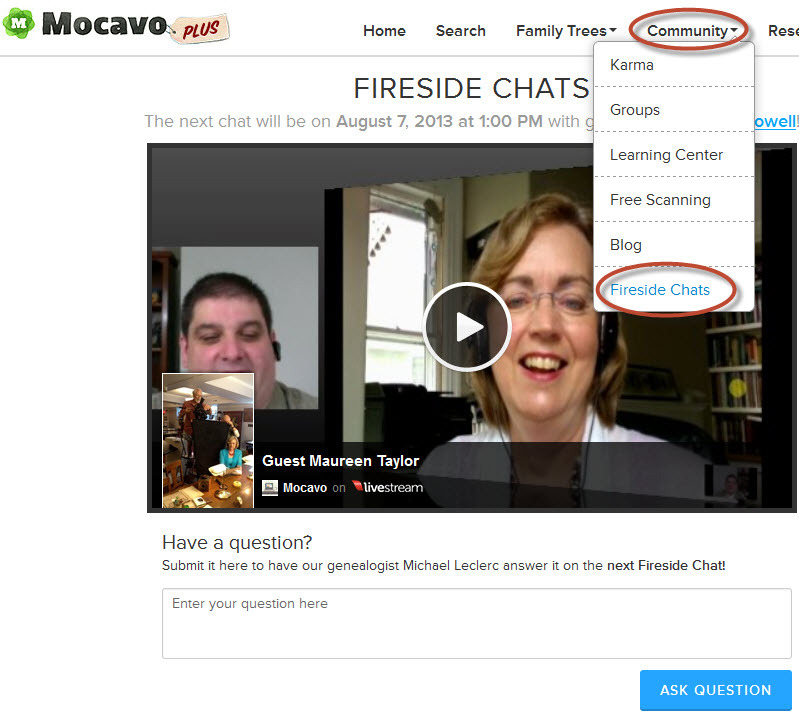 Queries are invited so Mocavo's host can answer them during the next Fireside Chat. "The next chat will be on August 7, 2013 at 1pm with guest Elissa Scalise Powell." Ol' Myrt's "inside sources" tell me that's 1pm EASTERN, folks. Elissa Scalise Powell, CG, CGL will be speaking on certification, and as a Certified Genealogist, a Certified Genealogical Lecturer and current President of the Board for Certification of Genealogists, Elissa is in a position to know. I recall a few years ago she was a co-coordinator of a course at the Salt Lake Institute of Genealogy where the BCG certification was discussed along with representatives from ICapGen who explained their accreditation process. Michael will undoubtedly ask Elissa about genealogy education opportunities, as she is co-director of the Genealogical Research Institute of Pittsburgh.